With disasters like earthquake, floods and structure collapses occurring frequently in India, the national calamity response force, National Disaster Response Force feels it is time that citizens are "trained" in combating both man-made and natural catastrophes. The view has also been endorsed by a recently published IIT Delhi case study on the working of the force. For the first time, the elite technology institution has worked on and prepared an analytical report on the response mechanism and challenges facing the National Disaster Response Force under the topic: "Leading from the Front: Awareness, Engagement and Intervention for Community Empowerment." The study paper, conducted by two researchers Dr Mahim Sagar and Deep Shree, was presented during the two-day 'Conference on Brand Management' hosted by the Indian Institute of Technology in New Delhi with an aim to "aggregate and share the latest research findings on brand management." While making his intervention during the presentation of the study on Saturday, NDRF Director General O P Singh stressed on the need to build a cohesive and structured response by the country in the face of disasters. "We empower the community on a regular basis as part of our social commitment which also works as our external branding. We do this when we are not tackling disasters. In fact, our view is that the entire nation needs to be trained on disaster management and disaster response and therefore, there has to be training on a regular basis," the DG said while interacting with researchers, scholars and faculty at the IIT Delh. Singh stressed community training is very essential and he spelled out the reasons for it. "How you communicate with the community, how you make the community as the first responder is very essential.In fact, I go a step further to say that the community is not only the first responder but it is the last responder as well.All the institutions and forces (that come for relief and rescue work) will leave but it is only the community that remains there to help you," he said. The chief of the about 12,000 specially trained personnel force, who has himself been at the forefront numerous times, recalled tragedies like the floods in Jammu and Kashmir and Chennai, the recent flyover collapse in Kolkata and last year's powerful earthquake in Nepal to buttress his point on having a focused response by all the stakeholders involved in such tragedies. "In India, we have millions of people exposed to natural and man-made disasters...which turn into nightmares. According to the vulnerability profile, India is one of the five most hit countries of the world followed by the US, China and few other countries. "About 4.8 million people are hit by disasters every year in India...hence it is very important to think if building resilience is going to be a personal choice or it is going to be a collective imperative," he said. The IIT case study not only praises the force for becoming the "most visible face" during disasters in a very short span of time but also underlines that it is struggling with several issues like shortfall of personnel, issues related to infrastructure for its responders and better response time in the wake of an information of a disaster getting unleashed in any part of the country. The study states that the NDRF needs good and smart equipment to save as many lives as possible during a calamity. 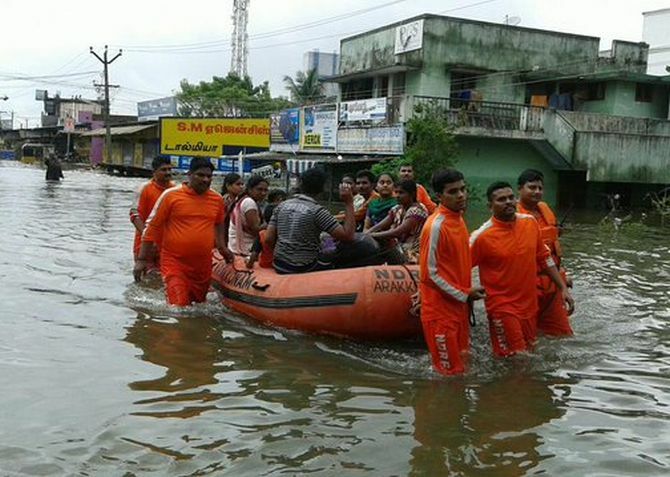 "The priority of the NDRF is to save maximum number of lives while sustaining minimum damage and this can be achieved only when it has the equipment which will help its personnel in taking swift action with utmost precision. "The procurement is no more a reactive activity, it is more of a proactive step being taken in accordance with the feedback received from personnel on ground and latest research in the area," the study said. It added the force has recently finalised procurement of 24 new gadgets including latest gadgets such as a level suits (to combat hazardous substances), light weight powerful generators, rope rider system, inflatable LED lights, life detectors and deep penetration ground sensing radars which will further help it in saving lives during earthquakes, floods and other calamities. "The procurement of these equipment will help the NDRF in tracing trapped victims and will also improve the communication and response mechanism," the study, prepared after months of working on the subject by the two IIT Delhi researchers, said. DG Singh said while he was happy that a not-for-profit social and government organisation like NDRF has been chosen as a subject to be included in the league of "brands", it was the forces' commitment with the cause that made it professional, pro-active, visible and innovative. In order to be a "visible fighter" in the realm of disaster management, the DG said, the force was deploying smart communication tools like usage of social media to make themselves more available to society and its welfare. The NDRF, a full deputationist organisation which draws its manpower from central paramilitary forces, works under the Union Home Ministry and its 12 battalions are stationed at strategic locations in the country aided by 23 regional response centres in other cities. The force was the lead unit working to provide succour to the victims of numerous tragedies including the 2013 Uttarakhand floods and rains and last year's quake in Nepal to count among the few prominent ones.